There are existing many theories about the history of the barbet. For years, they believe that the barbet was coming from Africa, but this is a misconception. Official document are showing that the barbet is coming from Central Europa. We find the barbet in France, but also in Italy, Spain and Portugal. The barbet is reflected in drawing and paintings from the Middle-Ages until today. He was very famous in the troups of Napoleon, but also during the First World War. After World War II, the barbet became rare. Officialy there is no barbet recorded in France between 1939 and 1966! 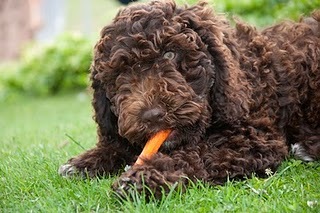 During the seventies, some breeders tried to breed the barbet again based on poodles, Portugese, Spanish and Irish water dogs. You can find more information about the history of the barbet on the official site of the French SCC: 'Chiens online'.